Watch a video of teal over an Association wetlands. What is common to early season Missouri Teal hunting in the Association is Blue Wing Teal hunting is the same as teal hunting anywhere. 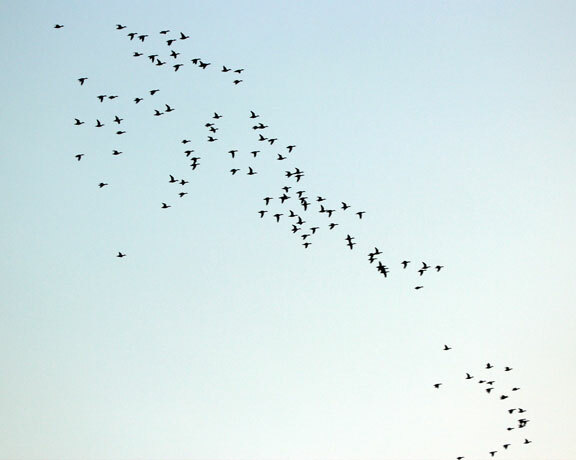 That is this migratory bird is not every where. Where it is found currently does not mean they will be there tomorrow. The point of repeating this common waterfowl knowledge is this self guided hunter organization requires the hunter to conduct his own scouting. The Association staff of three do not act as the personal guide for any one hunter. They do have knowledge of the wetland’s water level conditions and what they have seen in terms of teal. That knowledge will be shared. It is timely and not a guarantee of performance during a future hunt. Opening morning of Missouri Teal season. Just light enough for a picture. On an Association wetlands. Permanent blinds have not been covered with fresh camouflage. Generally, half of the wetlands would have been drained in the spring. The bottom worked. Planted with feed. Water inflow controls opened, outflow pipes closed and water being collected for the regular duck season. This will make the water level on those wetlands variable from week to week. Likewise the other wetlands that were not drained will have more water. Due to blinds not being re-camouflaged and water level variability it is wise to come prepared to hunt outside of a blind. Teal hunting is underutilized in the Association. It is much like dove season. That is of limited attraction. Most waterfowl hunters concentrate on ducks for the bulk of their energy and time. Some will teal hunt. The ones that do will do so for a weekend or two. Those that put in the effort to scout and locate the birds have had great success over the years. 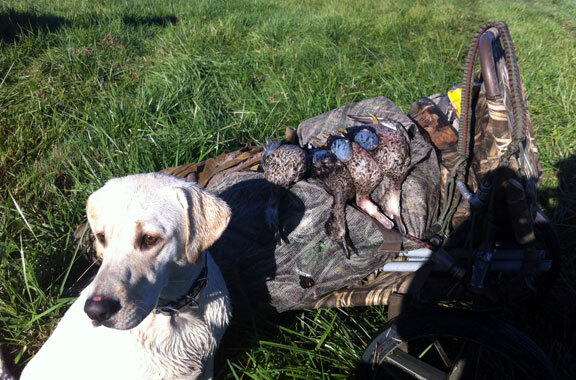 In Missouri, the early teal season usually opens the first or second Saturday in September. It often is warm. 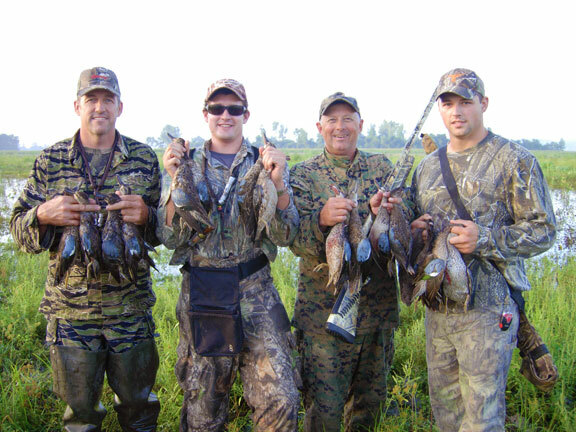 This is a great opportunity to test your gear and gun before the regular waterfowl season. 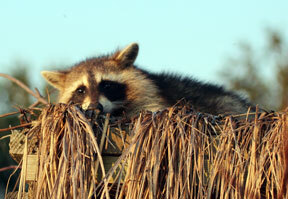 It’s also an opportunity to start a young dog in a natural waterfowl environment on private land. Bob’s Delta on her first Missouri teal hunt. Teal can be found almost anywhere. Our best concentrations are typically along the river bottoms near our managed wetlands. In preparation for teal season, we open our intake pipes and close our drain pipes by mid-August. This is when our moist soil vegetation is established. What is often planted is smart weed or millet. Many MAHA marshes have filled or partially filled for teal season with great hunting as a result. That is caused by the gradually rising water creating much of the shallows teal prefer. The holding water we do have is a valuable asset for the regular season. One holding lake is a 12 acres in size we retain for dry year conditions or to top off the wetlands. We retain that for the start of regular waterfowl season. That also is a prevention from residential waterfowl from gaining access to the food plots until we are ready for the hunt. Part of the quality that goes into the hunt. Our efforts are focused on the combination of food and water right at the start of duck season. An additional complication is our constant year round fight with beavers and muskrats. Keeping the wetlands as dry as we can prior to the season reduces the number of burrows into the levees surrounding the duck waters. Keep the wetlands dry and our year round effort to reduce these pesky vermin keep the levees intact so when we do flood the water does not flow out. So in the end, we do not move holding water to any of our marshes for the teal season. Our permanent blinds are available for teal season. They will be rough with only the prior season’s camouflage. We do not cover them for teal season to maximize the freshness of the camouflage for the regular duck season. Or, that time of year when waterfowl hunters most use the wetlands. The surrounding vegetation near the blinds and just about anywhere is typically thick. Rudimentary concealment efforts are effective for this early season. If you are the first one to hunt out of a blind, we recommend to thoroughly check the blind for any visitors or bees since it’s been sitting in the wild for 8 months. On dry years when the lake beds shrink down teal seem to work the mud flats next to natural vegetation. These are the good seasons when the teal are concentrated. Splash down of a strong flight. Above is a good example of less than the high controlled water level on this wetlands. The lily pads indicate this was a wetlands that was not drained in the spring for planting. The Association retaining water on half of the wetlands through the year is insurance of having water regardless of weather conditions come the opening of the season. A contributing factor is the workload required be the wetlands that were drained for repair and planting does take a good bit of time. 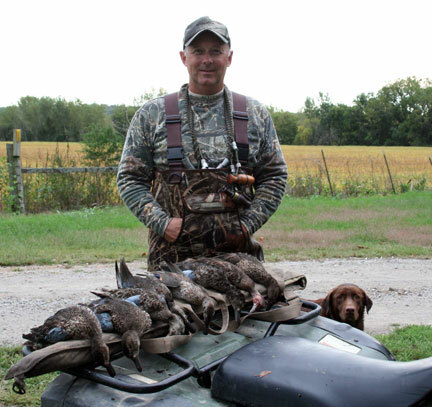 The end analysis is that his Association has been in the Missouri waterfowl hunting business a long time. We have been well practiced at the right balance of water management and workload to insure as best as possible the highest quality hunting we can make. During wet years, shallow pockets of water abound. they will be fond in grain fields along river bottoms, just about anywhere in north Missouri that has much low lands. They all can be very productive. But the catch is the hunter must locate these isolated bodies of water on their own. This is how the Association hunter with a number of seasons “grows” his own hunting spots from the wide range of land available. When concentrating his scouting and hunting efforts on a local 1,000 acres range of land there will often be more choices of where to hunt than time will allow. A good illustration about the advantage of Association lands being the ability to cover ground to find success. A much better approach of earning success through effort than requiring luck of sticking to just one spot and hope it works out. From a good season opening week.